CANopen is one of the most widely used application protocols today. Key benefits of this protocol include standardized device description files that make status information, parameter configurations, device characteristics and other relevant data available in transparent form on the network. A major decision made by the Ethernet POWERLINK Standardization Group (EPSG) was to define the protocol's application layer as a carrier of all CANopen mechanisms. CAN in Automation (CiA), the international association of CAN users and manufacturers, was significantly involved in this development. POWERLINK uses the same device description files as CANopen as well as the same object dictionaries and communication mechanisms, including process data objects (PDOs), service data objects (SDOs) and network management (NMT). As with CANopen, direct cross-traffic is also one of the essential features of POWERLINK. 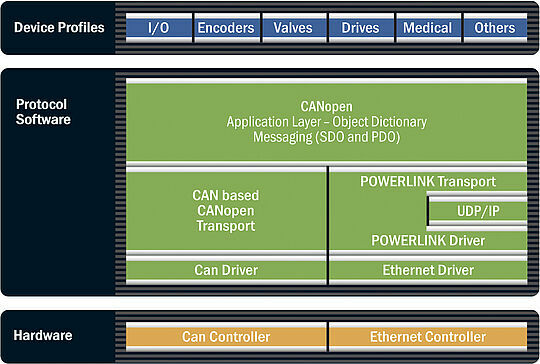 All CANopen applications and device profiles can be directly implemented in POWERLINK environments as well – the applications will not see a difference between the two protocols. For this reason, POWERLINK can also be referred to as "CANopen over Ethernet".